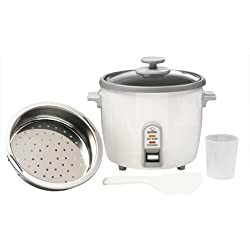 When it comes to the best rice steamer, folks should consider several factors such as simultaneous food steaming, whether or not the bowl is non-stick, along with other additional conveniences like specific rice settings, slow cooking settings, and how well the unit performs. This Aroma rice steamer is one of the best rice cooker and steamer models that offer the most benefits & features for the money. It is one of our favorite picks when considering performance, rice quality, and ease of use. First, this rice cooker uses what Aroma calls “Sensor Logic” technology (similar to Fuzzy Logic) which not only cooks the rice, but pays attention on how the rice is cooking using a special internal monitoring computer. The Aroma ARC-856 cooker makes subtle adjustments in cooking times and temperature resulting in a great tasting, very good rice quality dish! Much better than folks can achieve with a normal stove pot. Aroma’s Sensor Logic technology eliminates most of the guess work out of cooking rice, is easy to use, and remains budget friendly! The cooker has 3 different rice settings, white rice, brown rice, and sushi, comes with a steaming tray allowing folks to steam food while the rice is cooking, and even has a slow cooker setting. Although this feature could use some improvement. Rice will not crust or stick to the bottom, and the user will not have to deal with boil over issues since this unit has a sealed top lid design and condensation collector. 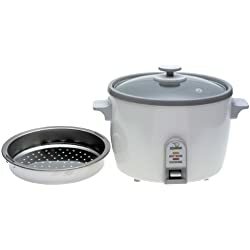 Currently, one of the best rice steamer cookers on the market. Another good consideration to compare with the below Zojirushi model is the Tiger JAZ series steamer cookers. 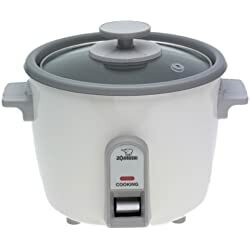 Now while they may not be the absolute best rice steamer choices on the market, nor do they offer multiple features & benefits like our first choice, the Aroma ARC-856, they do cook up good quality rice at a nice pace and allow folks that simultaneous food steaming option we always favor. Since the top lid is sealed (something which gives it a slight edge over the Zojirushi NHS series), folks will not experience boil over issues. However, some reported slight rice crusting on the bottom layer once completed…something which is a normal occurrence with these types of one-lever non-computerized cookers. If you fancy the “flower blossom” design, this is a good-rated rice steamer to go with. There are currently a 5.5 cup cooker and a 10 cup cooker. To conclude our best rice steamer cookers page, we would also like to post these Zojirushi NHS-06, 10 & 18 models. The NHS-06 is a 3 cup cooker, the NHS-10 a 6 cup cooker, and the NHS-18 a large 10 cup cooker. These rice steamer cookers are of a more basic design and sport a removable glass top lid for visually monitoring the steaming food & rice. They are very easy to use, just add the correct measurements, plug, and push the lever. The rice will cook fast and be completed in around 20 to 25 minutes depending on cup capacity. Since the rice cooker comes with a stainless steel steaming tray, the user can steam poultry, seafood, or vegetables while the rice is cooking making an entire healthy meal all in one machine. The only drawbacks are some mild rice crusting and spill over issues (try using powered seasoning to help avoid over-spill). Other than that, this cooker along with the others remain some of the best rice steamer choices on the market.